IG reported that the eruption at Wolf that began on 25 May continued through 2 June. Lava flows first reached the sea on 28 May. During an overflight on 29 May scientists observed a gas plume rising 2-3 km above the volcano and drifting NW, and smelled a strong sulfur odor. Active lava flows descended the E and NE flanks; cloud cover prevented views of the other areas but thermal images showed anomalies from lava flows on the SE and S flanks. The sulfur dioxide emission rate was 40,600 tons per day based on data collected during the flight. Satellite data collected since the beginning of the eruption indicated very minimal ash present in the plume. In addition, no ashfall was reported in the Galapagos Islands. The report also noted that activity had decreased during the recent few days. The first documented historical eruption in the Galapagos was at Wolf in 1797, and basaltic lava flows have spilled down its flanks a number of times since then. The most recent previous eruption began with an ash plume on 28 August 1982, and continued with lava fountains and flows from a fissure on the SE flank and inside the summit caldera into the first weeks of September 1982 (SEAN 07:08). Volcan Wolf erupted with a 15-km-high plume of mostly water vapor and SO2 on 25 May 2015. This was followed by the emission of lava flows from a fissure on the SE edge of the caldera down the NE, E, and SE flanks to the ocean for several weeks. Beginning on 13 June, the first lava flows were observed within the crater, and flows down the outer flanks decreased. Lava flows were also observed within the crater via satellite in late June, and strong daily thermal anomalies from the crater continued through 4 July before tapering off. The volcanoes on the Galapagos Islands are monitored by the Geophysical Institute of the National Polytechnic School (IG-EPN) in Quito, Ecuador, and the Washington Volcanic Ash Advisory Center (VAAC) is responsible for aviation warnings. IG maintains a broadband seismic network and a DOAS (Differential Optical Absorption Spectrometer) SO2 monitoring station on the islands that transmits data to the mainland. Ecuador's Instituto Geofisico (IG) reported that its seismic station FER1, located on Fernandina Island approximately 38 km SW of Wolf, began recording seismic events in the vicinity of Wolf at 2350 (local Galapagos time) on 24 May 2015. The most significant signal occurred at 0058 on 25 May, corresponding to an explosion and the start of an eruption. This was followed by other smaller seismic events in the following hours. At 0215 local time the Washington VAAC detected a plume that rose to an altitude of 10.7 km and drifted 65 km SW. Ongoing emissions at 0345 were drifting in two directions, S at 13.7 km altitude and ENE as high as 15.2 km. By 0600 the plumes were observed 250 km from the volcano. Later in the day at 1245 a remnant of the original plume was observed 186 km SSE of the summit, while a new emission at 10.7 km was detected 150 km SW. There was no report of ashfall in the Galapagos Islands, leading IG scientists to infer a low ash content for the plume, although a large SO2 plume was identified by satellite instruments. At first light, personnel from the Galapagos National Park (PNG) were able to photograph the plume and a lava flow erupting from a fissure on the SSE flank (figure 1). A strong thermal anomaly on the SE flank was also detected in MODIS data analyzed by the Hawai'i Institute of Geophysics and Planetology (HIGP) MODVOLC system early on 25 May, and grew stronger in subsequent days. A very strong SO2 plume, eventually releasing around 200 kt of sulfur dioxide, was also captured by the Aura/OMI satellite SO2 instrument on 25 and 26 May (figure 2). Figure 1. The first images of the eruption taken in the early morning on 25 May 2015 show lava flowing down the SSE flank of Wolf. Courtesy of Dr. Galo Quezada, Galapagos National Park (PNG) (IG-EPN, Informe Volcanico Especial Galapagos No. 2, 25 May 2015). Figure 2. Sulfur dioxide emissions from Wolf captured by the OMI instrument on the Aura satellite on 25 and 26 May 2015. The total release for the event was around 200 kilotons of SO2. Courtesy of NASA Goddard Space Flight Center (GSFC). In the days following the explosion, lava flows descended the NE, E, and SE flanks from a fissure located near the edge of the caldera. IG scientists were able to observe the flowing lava during an overflight on 29 May (figures 3 and 4). They noted a steam plume rising 2-3 km above the volcano with no visible ash, and a strong sulfur odor. Figure 3. Incandescent lava flows down the NE flank of Wolf on 29 May 2015. Courtesy of B. Bernard, IG-EPN (Informe Volcanico Especial Galapagos No. 3, 2 June 2015). Figure 4. Oblique satellite image from the NE of the lava field on the E flank of Wolf. The two incandescent flows are outlined in orange with the probable fissure vent shown in red. The blue line is the flight path taken on 29 May 2015. Image was taken by the ALI (Advanced Land Imager) camera on board the EOS-1 satellite on 28 May 2015, and superimposed on Google Earth imagery by IG-EPN scientists. Courtesy of B. Bernard, IG-EPN (Informe Volcanico Especial Galapagos No. 3, 2 June 2015). By 28 May the E lava field was approximately 7 km long and flows had reached the ocean. Thermal imaging during the overflight revealed two areas with apparent maximum temperatures (TMA) greater than 500°C, one at the site of the fissure near the caldera rim, and one in the lava field on the E flank. SO2 emissions measured during the overflight were 40.6 kt/day. 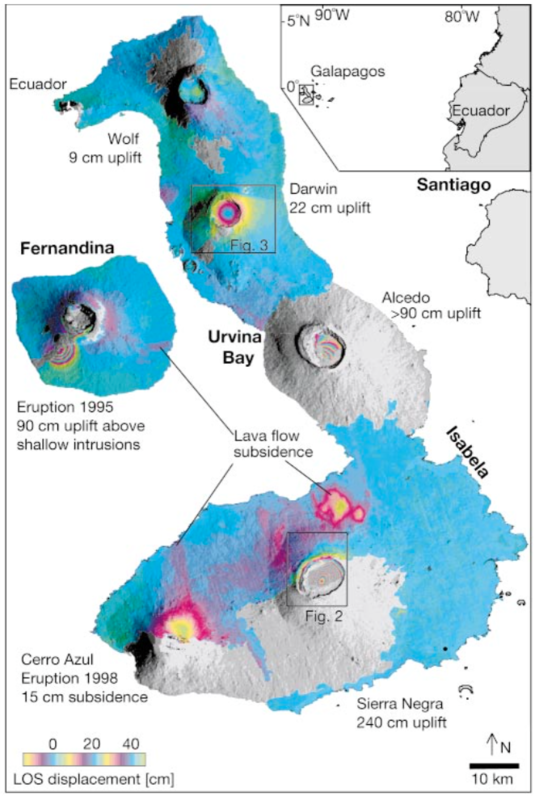 Satellite images gathered on 5 and 11 June confirmed the source of the lava flows as an arcuate fissure around the SE and E edges of the caldera in a similar location to the 1982 fissure. Another overflight by IG-EPN scientists on 12 June confirmed the continuing emission of lava flows down the SE and E flanks. The helicopter landed on the north rim of the crater with a view to the south of the lava flow from the 1982 eruption and gases emitting from the active fissure zone (figure 5). IG scientists heard at least five explosions during their visit to the crater rim. Thermal images gathered during the 12 June flight revealed that temperatures of the flows on the SE flank had dropped to less than 100°C, but temperatures at the fissure vent were still greater than 500°C, and steaming lava was observed near the emission zone (figure 6). Figure 5. Panorama of the interior of the Wolf caldera on 12 June 2015 showing the lava flow from the 1982 eruption covering the floor, and gas clouds from the active fissure on the SE side of the caldera rim. Courtesy of P. Ramon, IG-EPN (Informe Volcanico Especial Galapagos No. 4, 26 June 2015). Figure 6. Lava flows near the source vent at Wolf on 12 June 2015 seen in a thermal image (top) and regular photograph (bottom). Courtesy of P. Ramon, IG-EPN (Informe Volcanico Especial Galapagos No. 4, 26 June 2015). On 13 June 2015 satellite imagery showed new thermal anomalies inside the crater, suggesting active lava flowing into the crater in addition to the flows on the E and SE flanks. This was confirmed with visible low-resolution imagery from the WorldView 3 satellite on 16 June which showed an area of likely incandescence near the S rim. An image from the WorldView 1 satellite on 18 June showed a new lava flow on the floor of the caldera (figure 7). IG-EPN scientists combined the thermal data from their overflights with satellite imagery to define the areas of new lava flow through late June (figure 8). Figure 7. Satellite images of Wolf showing an incandescent zone and possible new vent on 16 June 2015 (circle at left; image from WV3 satellite), and a new lava flow inside the caldera on 18 June (right, image from WV1 satellite). Courtesy of IG-EPN (Informe Volcanico Especial Galapagos No. 4, 26 June 2015). Figure 8. Preliminary estimate of areas covered by lava flows from the eruption at Wolf beginning 25 May 2015 through 25 June. Base from Google Earth. Courtesy of IG-EPN (Informe Volcanico Especial Galapagos No. 4, 26 June 2015). The thermal alert pixels from the MODVOLC system show an evolution of the heat anomalies from the MODIS infrared satellite data that corresponds well with the satellite imagery and ground observations. The first anomalies were recorded on 25 May 2015. Strong multi-pixel anomalies (in some cases, more than 50 per day) were mapped daily until 4 July. After this, they become intermittent, and the daily number dropped below 11, tapering to one or two pixels every few days between 17 July, with the last two observed on 1 August. Two lobes of lava flows to the E and SE can be distinguished on the MODVOLC maps between 25 May and 12 June; anomalies within the crater appear on 13 June, increase to a maximum in the third week of June, and then taper off during July (figure 9). Figure 9. Four MODVOLC thermal anomaly maps of Wolf showing the evolution from lava flows down the E and SE flanks (29 May and 12 June 2015) to the active flows inside the crater (13 and 16 June). Green grid lines represent decimal degrees of longitude and latitude. Data courtesy of MODVOLC. MODIS data processed by MIROVA recorded a large thermal energy signature between 25 and 30 May, which then decreased for several days before increasing again in the second week of June (figure 10). The MIROVA radiative power data showed that the anomalies continued to decrease, suggestive of cooling lava flows, through November 2015, however, they picked up again early in 2016 (figure 11), indicating some continuing source of heat from the volcano. Figure 10. Radiant energy of thermal anomalies at Wolf detected by MIROVA from 25 May through 25 June 2015. Note the spike on 25 May followed by the decrease in values until after 15 June when they again increased (upper graph). Courtesy of MIROVA, taken from IG-EPN (Informe Volcanico Especial Galapagos No. 4, 26 June 2015). Figure 11. MIROVA analysis of MODIS infrared satellite data from Wolf between 6 September 2015 and 6 September 2016 showing Log Radiative Power (top), Radiative Power (middle), and Distance from summit (bottom). Virtually all of the anomalies are located within 5 km of the summit (lower graph). A gradual decrease in the anomalies between September and 1 December 2015 is consistent with cooling lava flows. Waxing and waning anomalies between March and September 2016 indicate some continued source of heat from Wolf. Courtesy of MIROVA. No further special reports were issued by the Instituto Geofisico after June 2015 and available evidence suggests active lava flows ceased by late July 2015. Information Contacts: Instituto Geofísico, Escuela Politécnica Nacional (IG-EPN), Casilla 17-01-2759, Quito, Ecuador (URL: http://www.igepn.edu.ec/); Washington Volcanic Ash Advisory Center (VAAC), Satellite Analysis Branch (SAB), NOAA/NESDIS OSPO, NOAA Science Center Room 401, 5200 Auth Rd, Camp Springs, MD 20746, USA (URL: http://www.ospo.noaa.gov/Products/atmosphere/vaac/) [Archive at: http://www.ssd.noaa.gov/VAAC/archive.html]; Hawai'i Institute of Geophysics and Planetology (HIGP), MODVOLC Thermal Alerts System, School of Ocean and Earth Science and Technology (SOEST), Univ. of Hawai'i, 2525 Correa Road, Honolulu, HI 96822, USA (URL: http://modis.higp.hawaii.edu/, http://modis.higp.hawaii.edu/cgi-bin/modisnew.cgi); NASA Goddard Space Flight Center (NASA/GSFC), Global Sulfur Dioxide Monitoring Page, Atmospheric Chemistry and Dynamics Laboratory, Goddard, Maryland, USA (URL: https://so2.gsfc.nasa.gov/); MIROVA (Middle InfraRed Observation of Volcanic Activity), a collaborative project between the Universities of Turin and Florence (Italy) supported by the Centre for Volcanic Risk of the Italian Civil Protection Department (URL: http://www.mirovaweb.it/). According to IG the seismic station located on Fernandina Island recorded several events at Wolf (on Isabela Island) starting at 2350 on 24 May. The most significant signal occurred at 0058 on 25 May, corresponding to an explosion and the start of an eruption. At 0215 the Washington VAAC detected an ash plume that rose to an altitude of 10.7 km (35,000 ft) a.s.l. and drifted 65 km SW. At 0345 one ash plume drifted 250 km ENE at an altitude of 15.2 km (50,000 ft) a.s.l., and another drifted 250 km S at an altitude of 13.7 km (45,000 ft) a.s.l. Starting at 0428 the Hawai'i Institute of Geophysics and Planetology (HIGP) reported intense thermal anomalies on Wolf's SE flank based on MODIS satellite data. Galapagos National Park staff reported an arcuate fissure along the upper SSE rim and several lava flows descending the flanks. Later that day the VAAC noted a smaller ash emission that drifted 150 km SW, and a bright thermal anomaly that had persisted. Satellites detecting sulfur dioxide showed that the cloud was sulfur-dioxide rich and ash poor; ~100-200 kt of sulfur dioxide had been emitted during the first 13 hours of the eruption. A small earthquake swarm took place in the Galapagos Islands in late January 1973. The Charles Darwin Research Station reported 57 events on its seismograph (GIE) from 23 through 28 January and estimated an epicentral distance of 110-160 km. The NOS/NOAA National Earthquake Information Center has located hypocenters for three events (Mb 4.4 and 4.5). These fit the Research Station's estimates, and are 15 km E, 26 km E, and 5 km SW of the center of Wolf, Isla Isabella. Dr. John Filson reports additional events (Mb 4.0-4.3) detected by LASA on 16 January and 18 February; the latter events are confirmed by NOS/NOAA but reliable hypocenters have not yet been located. The Charles Darwin Research Station reports no visible activity associated with this earthquake swarm. Information Contacts: R. Sievers, Charles Darwin Research Station, Galapagos Islands, Ecuador; W. Person, U.S. National Earthquake Information Center; J. Filson, Massachusetts Institute of Technology; T. Simkin, SI. "Galapagos National Park Wardens on W flank of Wolf two weeks ago heard strong and constant rumbling from caldera. The roar could be heard at the coast 6 km from the caldera rim and continued through the night. No reports of eruptive cloud, but clouds frequently obscure summit and volcano cannot be seen from inhabited parts of the archipelago. Darwin Station seismograph reports no unusual activity, but earthquake swarm early this year (see Event Card 1588) appeared centered on the SE flank of Wolf, the site of the last, largest (Mb 4.9), and best-located event on 19 March 1973. Darwin Station party is en route to investigate and SKYLAB will photograph. "The last recorded eruptions of this, the northernmost shield volcano on the largest Galapagos Island, were on the SE flank in 1948 and 1963. 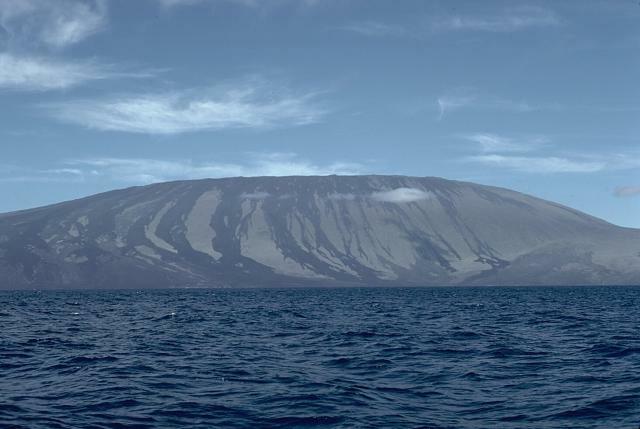 The equator crosses the S end of the caldera at 91.3°W and the rim is 6 km in diameter, 1,710 m above the sea, and 670 m above the caldera floor. 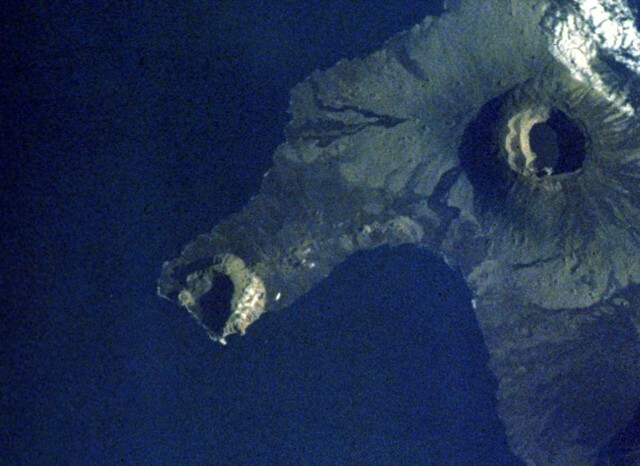 Reports of Galapagos volcanism in early August of this year appear to have been influenced by NASA press release on successful SKYLAB photography of 'Galapagos Eruptive Centers.' No Galapagos eruption was sighted by SKYLAB II but shortly after the press release emerged from Ecuadorian newspapers clouds and lights were reported from the volcano at Cape Berkeley, NW Isabella. These reports have been investigated on the volcano by Darwin Station personnel and no evidence of an August eruption has been found. The only other Galapagos volcanism known since the 1968 Fernandina caldera collapse is the 1972 Fernandina eruption reported in June of this year (Event Card 1659). . . ."
Information Contacts: Peter Kramer, Charles Darwin Research Station, Galapagos Islands, Ecuador; Tom Simkin, SI. Observations from space... support previous indication of eruption on Wolf (Event Card 1749), and suggest strong thermal activity on Darwin. . . . NOAA-2 [satellite imagery] shows additional hot spots on E flank of Wolf . . . .
Close inspection of NOAA-2 imagery shows hot spots reported on Event Card 1752 coincide with caldera floors, not outer flanks, and can probably be explained by normal daytime temperature differences. . . . Darwin Station party "saw nothing on Wolf" but gave no further details on that eruption (Event Card 1749). Information Contacts: Card 1752 (13 December 1973)F. Parmenter, NOAA; M. McEwen, NASA; J. Filson, MIT; T. Simkin, SI. Card 1757 (17 December 1973)A. Krueger and F. Parmenter, NOAA; J. Filson, MIT; P. Kramer, Darwin Research Station; T. Simkin, SI. Eruption clouds began to emerge from the volcano during the afternoon of 28 August. Plume emission was first detected on visible band satellite images between 1300 and 1400, and feeding continued until nightfall. The plume, which drifted W, could not be seen on infrared imagery, indicating that it remained at low altitudes. Observers on a tour ship first saw clouds issuing from the summit about 1430-1500 and reported strong summit glow that night. Activity on the SE flank was first observed at 0830 the next morning, but heavy weather clouds had obscured this area the previous afternoon, and flank vents may have been active then as well. Tui DeRoy Moore and others arrived at the SE flank late 31 August. Lava fountained from a radial fissure that extended 1 km or more downslope from 875 m altitude. Fresh lava covered the area near the fissure. Lava flowed SE then turned toward the E, reaching about 280 m altitude. This flow had stopped advancing by 1 September and fountaining had ended by that evening, although some SE flank glow remained visible. As the flank activity declined, summit activity increased. Summit glow had been visible since 28 August, but strengthened during the night of 1-2 September and a large convecting cloud was present over the caldera. Moore reached the caldera rim on 3 September and found several vents active in the caldera, the strongest on its floor at the base of the steep SW wall. Lava fountaining from this vent was continuous and the fountains occasionally rose as high as the caldera rim, approximately 700 m above the floor. Intermittent, relatively weak fountaining (less than 50 m estimated height) occurred from four small vents along a 100-200-m-long fissure on the S caldera floor. Thick-looking pahoehoe lava covered slightly more than half of the caldera floor, or approximately 6 km2, and was mainly on the N and NW side. Gases emerging from the base of the convecting eruption cloud formed a haze that drifted W, away from the observers. By early 4 September, when Moore left the volcano, a cone had begun to form around the main vent. Activity appeared to be dominated by scoria ejection, with little lava being added to the caldera floor flows. No earthquakes were felt by the observers, and Moore reported that there seemed to be little effect on the flora and fauna. Glow was still visible in the eruption cloud late 5 September and airplane passengers saw a strong plume 6 September. Wolf has been one of the more active Galápagos volcanoes. Flank eruptions from the same SE vent area took place in 1948 and 1963, but summit caldera activity had not been documented since 1800. A probable SE flank eruption was heard but not seen in 1973. The present eruption is a two-hemisphere event, with the caldera lying mostly N of the equator and the SE vent, less than 10 km distant, in the Southern Hemisphere. Further Reference. Schatz, H., and Schatz, I., 1983, Der ausbruch des Vulkanes Wolf (Inseln Isabela, Galápagos-Inseln Ecuador) im Jahre 1982—Ein Augenzeugenbericht; Ber. Nat. Med. Verein Innsbruck; v. 70, p. 17-28. Information Contacts: T. Moore, Isla Santa Cruz, Galápagos. Wolf, the highest volcano of the Galápagos Islands, straddles the equator at the north end of the archipelago's largest island, Isabela. The 1710-m-high edifice has steeper slopes than most other Isabela volcanoes, reaching angles up to 35 degrees. 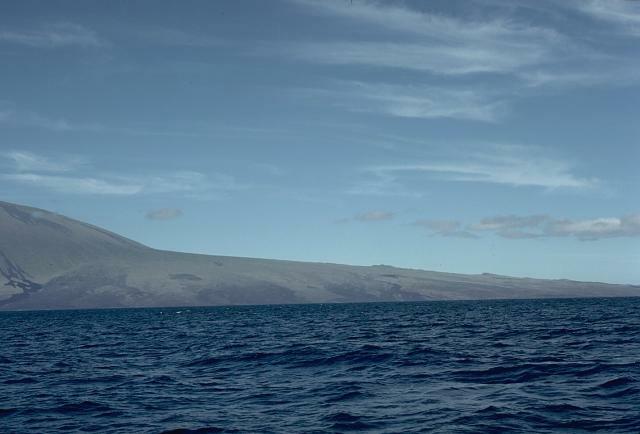 A 6 x 7 km caldera, at 700 m one of the deepest of the Galápagos Islands, is located at the summit. A prominent bench on the west side of the caldera rises 450 above the caldera floor, much of which is covered by a lava flow erupted in 1982. Radial fissures concentrated along diffuse rift zones extend down the north, NW, and SE flanks, and submarine vents lie beyond the north and NW fissures. Similar unvegetated flows originating from a circumferential chain of spatter and scoria cones on the eastern caldera rim drape the forested flanks to the sea. The proportion of aa lava flows at Volcán Wolf exceeds that of other Galápagos volcanoes. An eruption in in 1797 was the first documented historical eruption in the Galápagos Islands. Delano, A, 1817. Narrative of Voyages and Travels in the Northern and Southern Hemispheres: Comprising Three Voyages Round the World; Together with a Voyage of Survey and Discovery, in the Pacific Ocean and Oriental Islands.. E.G. House, Boston. Geist D J, Naumann T R, Standish J J, Kurz M D, Harpp K S, White W M, Fornari D J, 2005. Wolf volcano, Galapagos archipelago: melting and magmatic evolution at the margins of a mantle plume. J Petr, 46: 2197-2224. MARY WILDER (Ship) New Bedford, 1859. Journal, April 1, 1859-Nov. 5, 1859. Abner F. Barker, Master. Nicholson Whaling Collection, Providence Public Library, Providence, RI. Reel 448. Transcribed by K. Thalia Grant (2014). Veeder, Susan C. Austin, 1853. Journal of the Whaleship Nauticon, September 13, 1848 - March 24, 1853. Charles Veeder, Master.. Nantucket Historical Association, NHA Manuscript Collection 220, Log 347. Digital Exhibition. Transcribed by K. Thalia Grant (2014). Wilson, G H, 1861. Journal, Jan. 30, 1859-May 3, 1861. On the bark OSCEOLA 3D, New Bedford. Otis F. Hamblin, Master. Nicholson Whaling Collection, Providence Public Library, Providence, RI. Reel 532. Transcribed by K. Thalia Grant (2014). Remarks: Deformation at Wolf during 1992-1997 can be modeled by a Mogi point source. Wolf, the highest volcano of the Galápagos Islands, straddles the equator at the north end of the archipelago's largest island, Isabela. Volcán Wolf shield volcano has steeper slopes than most other Isabela volcanoes. 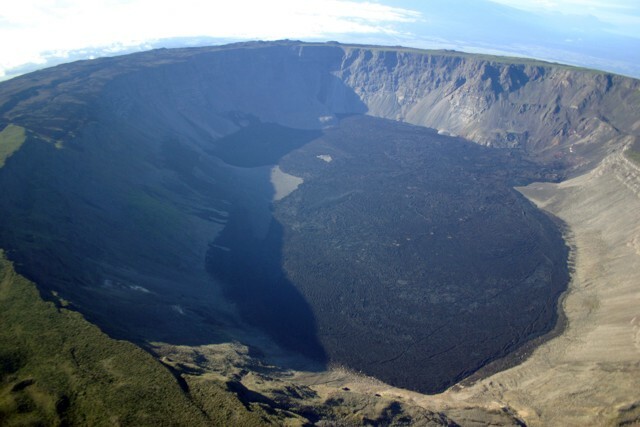 A 5.5 x 7 km caldera, 600 m deep, is located at the volcano's summit. The broad caldera floor is largely covered by fresh, unvegetated lava flows. Prominent unvegetated lava flows drape forested eastern flanks of the volcano to the sea. Wolf's 1797 eruption was the first documented in the Galápagos Islands. A radial fissure on the NE flank of Volcán Wolf has produced extensive lava flows that in part lap onto the flanks of the main shield volcano. A sharp break in slope separates the low-angle flank rift zone, whose smooth profile is interrupted by a few small cinder cones, from the upper shield volcano, which has some of the steepest slopes of Galápagos shield volcanoes. A fresh unvegetated lava flow from the main shield at the extreme left was deflected to the south by the lava produced from the NE rift. Volcán Ecuador (left center) forms the tip of a peninsula straddling the equator at the NW end of Isabela Island. The western side of the volcano, the smallest of the six large shield volcanoes on Isabela, is breached nearly to sea level. A line of fissure-fed vents on the outer eastern flank can be seen connecting Volcán Ecuador with Volcán Wolf (upper right). Despite the absence of historical eruptions from Volcán Ecuador, the youthful morphology of its most recent lava flows resembles those of very recent flows on other Isabela Island volcanoes. Photo by National Aeronautical and Space Administration (NASA), 1988. An aerial view from the north looks across the 6 x 7 km wide summit caldera of Volcán Wolf. Fresh-looking, dark-colored lava flows, erupted from fissures on the eastern and western caldera walls, cover much of the caldera floor. 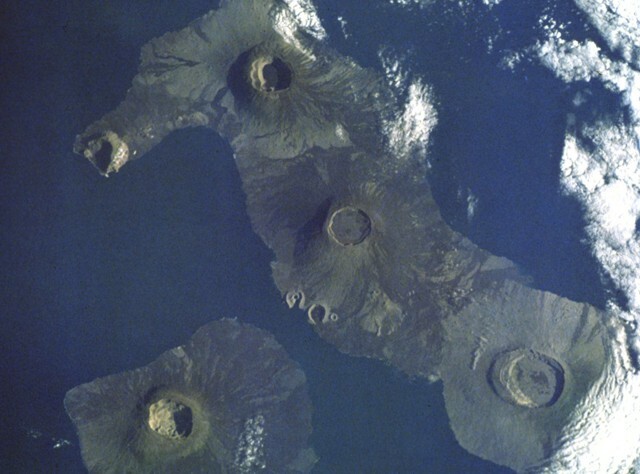 At 1710 m, Wolf is the highest of the Isabella Island shield volcanoes. Photo by Patricio Ramon, 2005 (Instituto Geofisca, Escuela Politecnica Nacional). The Global Volcanism Program has no maps available for Wolf. There are no samples for Wolf in the Smithsonian's NMNH Department of Mineral Sciences Rock and Ore collection. Large Eruptions of Wolf Information about large Quaternary eruptions (VEI >= 4) is cataloged in the Large Magnitude Explosive Volcanic Eruptions (LaMEVE) database of the Volcano Global Risk Identification and Analysis Project (VOGRIPA).